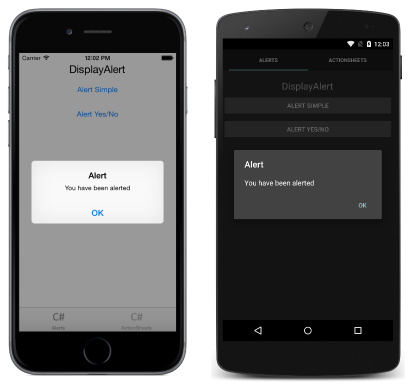 Xamarin.Forms provides two pop-up-like user interface elements – an alert and an action sheet. This article demonstrates using the alert and action sheet APIs to ask users simple questions and to guide users through tasks. Displaying an alert or asking a user to make a choice is a common UI task. Xamarin.Forms has two methods on the Page class for interacting with the user via a pop-up: DisplayAlert and DisplayActionSheet. They are rendered with appropriate native controls on each platform. This example does not collect information from the user. The alert displays modally and once dismissed the user continues interacting with the application. The UIActionSheet is a common UI element in iOS. 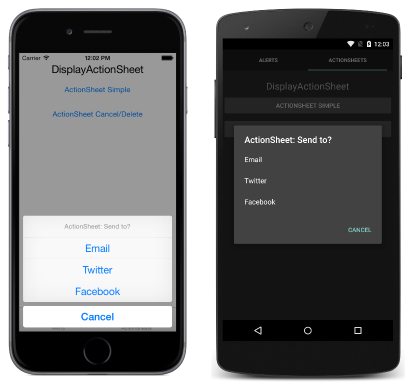 The Xamarin.Forms DisplayActionSheet method lets you include this control in cross-platforms apps, rendering native alternatives in Android and UWP. This article demonstrated using the alert and action sheet APIs to ask users simple questions and to guide users through tasks. Xamarin.Forms has two methods on the Page class for interacting with the user via a pop-up: DisplayAlert and DisplayActionSheet, and they are both rendered with appropriate native controls on each platform.